Don't miss out on this fantastic urban opportunity to live in the heart of Chattanooga in the desirable Museum Bluffs/Parkside condo community. This unit offers a great view of the city. You can watch fireworks from AT&T field and Riverbed from the privacy of your own home. You will be within walking distance of The Edwin Hotel, Hunter Museum Art District, Walnut Street walking bridge, shopping, restaurants, parks and more. 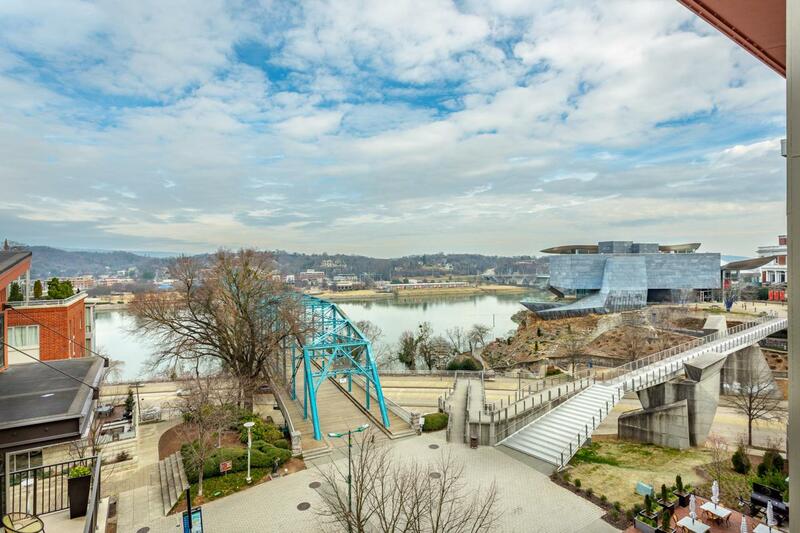 This 2 bedroom 2.5 bath unit offers a great view of the aquarium and the climbing wall with the river and mountains as a scenic backdrop. This unit has it's very own street level private entrance in addition to the secured building entry with access from the garage. The spacious floor plan is over1680 sq. ft making it one of the largest floor plans in the building.The kitchen is open to the living and dining areas and boasts hardwood floors with updated lighting. The kitchen has granite counter tops and upgraded stainless appliances. Additional cabinets with pull out drawers have been built into to the kitchen to provide an abundance of kitchen storage space not found in other condominium units in the buildinThere is a closet under the stairs which provides additional storage.. The master bedroom has hardwood floors, a walk-in closet with an abundance of shelves and drawers for all your storage needs. A sleek master bath with dual vanity sinks, shower with tile and glass surround, The second bedroom is located one level below the main living area and includes a spacious walk-in closet There is a full bath on this second bedroom level as well as a laundry closet. The street level entrance offers access to a spacious multiple functional room. This space has custom built in shelves and cabinets, a full walk-in closet and a half bath. This room is suitable for work from home, an additional larger den for entertaining guests or it could be an additional bedroom. Several other upgrades to this unit include WiFi, programmable thermostats, blinds, remote control ceiling fans in all rooms, a staircase and railing like no other in the building on the main level leading to master bedroom and built in kitchen sweep vac. This Unit offers two parking spaces in the secure garage. A 12x3.6 storage closet comes with this unit as well. Don't miss out on this wonderful opportunity! Parking space are G in the main garage and 138 on roof. The storage closet is on second floor. This is a multi level unit. There are no units built above or below this unit ensuring additional privacy.